دارند, محمد, زندکریمی, سوما. (1395). ارزیابی دقت داده‌های بارش مرکز اقلیم‌شناسی بارش جهانی بر روی ایران. 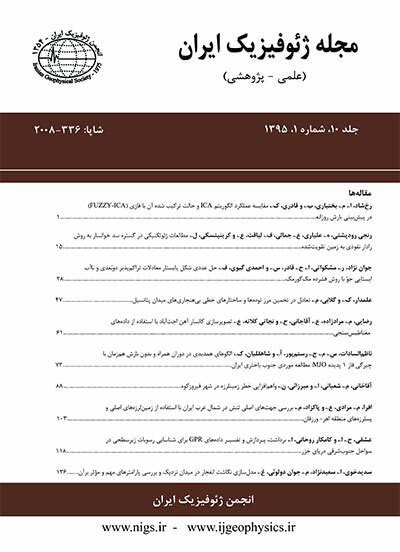 مجله ژئوفیزیک ایران, 10(3), 95-113. محمد دارند; سوما زندکریمی. "ارزیابی دقت داده‌های بارش مرکز اقلیم‌شناسی بارش جهانی بر روی ایران". مجله ژئوفیزیک ایران, 10, 3, 1395, 95-113. دارند, محمد, زندکریمی, سوما. (1395). 'ارزیابی دقت داده‌های بارش مرکز اقلیم‌شناسی بارش جهانی بر روی ایران', مجله ژئوفیزیک ایران, 10(3), pp. 95-113. دارند, محمد, زندکریمی, سوما. ارزیابی دقت داده‌های بارش مرکز اقلیم‌شناسی بارش جهانی بر روی ایران. مجله ژئوفیزیک ایران, 1395; 10(3): 95-113. برای انجام این پژوهش داده‌های بارش ماهانه‌ سه پایگاه مرکز اقلیم‌شناسی بارش جهانی (GPCC)، اسفزاری و ایستگاه‌های همدیدی بر روی ایران طی بازه‌ زمانی 1962 تا 2010 استفاده شد. برای سنجش دقت مقادیر برآوردی بارش پایگاه داده GPCC ابتدا به‌کمک تابع نزدیک‌ترین همسایه تفکیک مکانی همسان‌سازی شد. رویکرد تراکم بیشتر به تراکم کمتر برای گزینش یاخته‌های مکانی و مقایسه پایگاه‌ها به‌کار گرفته شد. از هفت نمایه واکاوی ارزیابی دقت مقادیر بارش در ابعاد زمان و مکان استفاده شد. یافته‌های حاصل از این پژوهش بیانگر هماهنگی و همبستگی زمانی بسیار بالای بارش برآورد شده‌ این پایگاه با دو پایگاه داده ملی اسفزاری و ایستگاهی است. کاربست شاخص‌های ارزیابی دقت بر روی سری زمانی مقادیر بارش پایگاه داده GPCC نشان داد که علاوه بر هماهنگی زمانی در افت‌وخیزهای بارش، مقادیر بارش برآوردشده این پایگاه بسیار نزدیک به مقادیر بارش مشاهده و ثبت شده است. اگرچه در برخی مناطق مقادیر بارش برآورد شده همراه با اُریبی است ولی نسبت خطای مقادیر برآوردشده به مقدار کل بارش مشاهده‌شده بسیار کوچک است. از لحاظ پراکنش مکانی دقت این پایگاه در برآورد بارش بر روی نیمه غربی رشته کوه‌های زاگرس و شمال‌شرق کشور بیشینه است. بر روی این‌گونه مناطق شاخص توافق و ضریب تعیّن نزدیک به عدد یک است. بیشترین مقدار شاخص ریشه دوم میانگین مربعات خطای نسبی در مناطق بسیار خشک مرکزی و بیابان لوت مشاهده می‌شود. در مناطق پُربارش میزان شاخص یادشده به‌نسبت بسیار کوچک‌تر است. از لحاظ زمانی بیشترین هماهنگی در سری زمانی مقادیر بارش برآوردشده این پایگاه با دو پایگاه ملی اسفزاری و ایستگاهی در ماه‌های پربارش دیده می‌شود. برپایه یافته‌های حاصل از شاخص کارآیی ناش–ساتکلیف می‌توان گفت که کاربست و کارآیی مقادیر بارش برآورد شده این پایگاه بسیار بهتر از به‌کارگیری مقادیر میانگین بارش بر روی اغلب گستره ایران زمین است. یافته‌های این پژوهش تأییدی بر یافته‌های سایر پژوهشگران در ارتباط با دقت بالای مقادیر بارش برآورد شده پایگاه GPCC است. Precipitation is a vital component of the global water and energy cycle with large variations in space and time. The observational datasets that are based on meteorological stations data usually serve as the main sources of precipitation data. However, because of uneven distribution in space, such datasets may not be directly applicable to some problems. Furthermore, there are gaps in the data as there may be times for which the precipitation has not been recorded by some metrological stations for various technical reasons. In the last decades, several gridded precipitation databases have been developed by researchers or institutes. The main aim of creating these databases is to serve user requirements and solve the problems mentioned above. The even distribution in space of the gridded precipitation data and their availability are two very important factors. These databases are critical for many studies including climate change and numerical weather prediction (NWP) applications, management of water resources, agriculture, and disaster management. The Global Precipitation Climatology Centre (GPCC) has been established in the year 1989 at the request of the World Meteorological Organization (WMO). It is constructed by the Deutscher Wetterdienst (DWD, National Meteorological Service of Germany) as a German contribution to the World Climate Research Programme (WCRP). The precipitation data of GPCC are freely available via the website http://gpcc.dwd.de at 2.5º × 2.5º, 1º×1º, and 0.5 º × 0.5 º resolutions. The aim of this research is to evaluate the accuracy of GPCC database over Iran by comparing it with two national databases, the Asfezari and that of the synoptic stations called Stations hereafter. The monthly precipitation data from the three databases including GPCC, Asfezari and Stations have been used from January 1962 to the end of December 2010. To evaluate the accuracy of the estimated GPCC precipitation data, first the spatial resolutions of the three databases have been synchronized by the nearest neighbor algorithm. The high-resolution database is converted to the low-resolution database in order to select spatial pixels and carry out the comparisons. Seven accuracy evaluation indices have been used. The results indicate a high temporal correlation between the estimated precipitation of GPCC and the observed precipitation by the Asefazri and the Stations databases. The results of applying accuracy evaluation indices to the precipitation time series show that in addition to high temporal correlation, quantitatively the estimated precipitations are also very similar to the observed precipitations. Although in some regions the estimated precipitation values are contaminated with bias, but overall the estimated precipitation error is low compared to the total precipitation received. In a spatial viewpoint, the highest accuracy is observed over the western parts of Zagros mountain range and the northeast of the country. Over these regions, the index of agreement and the coefficient of determination are close to unity. The highest relative root mean square (rms) is observed over the dry interior regions and the Lut desert. The relative rms is low in the regions with high precipitation when compared with the rest of the regions. In a temporal viewpoint, the highest correlation between the precipitation time series is observed in rainy months. Based on the results from the Nash–Sutcliffe efficiency index, over most regions of the country, using the estimated precipitations by GPCC is preferable to applying the mean precipitation amounts. The results of this study confirmed the finding of other researches about the accuracy of the estimated precipitation by GPCC database. مسعودیان، س­ا.، کیخسرو­کیانی، م.، و رعیت­پیشه، ف.، 1393، معرفی و مقایسه پایگاه داده اسفزاری با پایگاه GPCC، GPCP و CMAP: فصلنامه تحقیقات جغرافیایی، 29(1) ، 73–88 . Belo-Pereira, M., Dutra, E., and Viterbo, P., 2011, Evaluation of global precipitation data sets over the Iberian Peninsula: J. Geophys. Res., Atmospheres, 116, D20101, doi: 10.1029/2010JD015481. Bosilovich, M. G., Chen, J., Robertson, F. R., and Adler, R. F., 2008, Evaluation of global precipitation in reanalyses: J. Applied Meteorology and Climatology, 47(9), 2279-2299. Chokngamwong, R., and Chiu, L. S., 2004, Comparisons of daily Thailand rain gauge with GPCC and TRMM satellite precipitation measurements: in the 2nd TRMM International Science Conference. Cohen Liechti, T., Matos, J. P., Boillat J. L., and Schleiss, A. J., 2012, Comparison and evaluation of satellite derived precipitation products for hydrological modeling of the Zambezi River Basin: Hydrol. Earth Syst. Sci., 16, 489–500. Dinku, T., Connor, S. J., Ceccato, P., and Ropelewski, C. F., 2008, Comparison of global gridded precipitation products over a mountainous region of Africa: International J. Climatology, 28(12), 1627–1638. Junzhi, L., A-Xing, Zh., and Zheng, D., 2012, Evaluation of TRMM 3B42 precipitation product using rain gauge data in Meichuan Watershed, Poyang Lake Basin, China: J. Resour. Ecol., 3(4), 359–366. Katiraie-Boroujerdy, S.P., Nasrollahi, N., Hsu, KL., and Sorooshian, S., 2016, Quantifying the reliability of four global datasets for drought monitoring over a semiarid region: Theor. Appl. Climatol., 123, 387-398. Kessler, E., and Neas, B., 1994, On correlation with application to the radar reengage measurement of rainfall: Atmos. Res., 34, 217–229. Kidd, C., and Huffman, G., 2011, Global precipitation measurement: Meteor. Appl., 18, 334–35. Legates, D. R., and Davis, R. E., 1997, The continuing search for an anthropogenic climate change signal: Limitations of correlation-based approaches: Geophys. Res. Lett., 24, 2319–2322. Legates, D. R., and McCabe Jr., G. J., 1999, Evaluating the use of ‘‘goodness-of-fit’’ measures in hydrologic and hydroclimatic model validation: Water Resour. Res., 35 (1), 233–241. Lin, R., Zhou, T., and Qian, Y., 2014, Evaluation of global monsoon precipitation changes based on five reanalysis datasets: J. Climate., 27, 1271–1289. Moore, D. S., 1991, Statistics Concepts and Controversies, New York. Nash, J. E., and Sutcliffe, J. V., 1970, River flow forecasting through conceptual models, I. A discussion of principles: J. Hydrol., 10, 282–290. Nicholson, S.E., 1986, The spatial coherence of African rainfall anomalies: Interhemispheric teleconnections: J. Climate. Appl. Meteor., 25,1365–1381. Nicholson, S.E., 1993, An overview of African rainfall fluctuations of the last decade: J. Climate., 6,1463–1466. Nicholson, S.E., 2008, The intensity, location and structure of the tropical rainbelt over West Africa as a factor in interannual variability: Int. J. Climatology, 28,1775–1785. Prakash, S., Mahesh, C., and Gairola, R. M., 2011, Large-scale precipitation estimation using Kalpana-1 IR measurements and its validation using GPCP and GPCC data: Theor. Appl. Climatol., 106(3-4), 283–293. Raziei, T., Bordi, I., and Pereira, L. S., 2011, An application of GPCC and NCEP/NCAR datasets for drought variability analysis in Iran: Water Resources Management, 25(4), 1075–1086. Rudolf, B., Hauschild, H., Rueth, W., and Schneider, U., 1994, Terrestrial precipitation analysis: Operational method and required density of point measurements: Global precipitations and climate change: Springer Berlin Heidelberg, 26, 173-186. Shneider, U., Becker, A., Finger, P., Meyer-Christofer, A., Ziese, M., and Rudolf, B., 2014, GPCC's new land surface precipitation climatology based on quality-controlled in situ data and its role in quantifying the global water cycle: Theor. Appl. Climatol., 115, 15–40. Silva, V. B. S., Kousky, V. E., and Higgins, R. W., 2011, Daily precipitation statistics for South America: An intercomparison between NCEP reanalyses and observations: J. Hydrometeorology, 12, 101–117. Sohn, S.-J., Tam, C.-Y., Ashok, K., and Ahn, J.-B., 2012, Quantifying the reliability of precipitation datasets for monitoring large-scale East Asian precipitation variations: International J. Climatology, 32, 1520–1526. Sylla, M. B., Giorgi, F., Coppola, E., and Mariotti, L., 2013, Uncertainties in daily rainfall over Africa: Assessment of gridded observation products and evaluation of a regional climate model simulation: International J. Climatology, 33, 1805–1817. Takahashi, K., Yamazaki, N., and Kamahori, H., 2006, Trends of heavy precipitation events in global observation and reanalysis datasets: SOLA, 2, 96–99. Tong, K., Su, F., Yang, D., Zhang, L., and Hao, Z., 2014, Tibetan Plateau precipitation as depicted by gauge observations, reanalyses and satellite retrievals: International J. Climatology, 34, 265–285. Wilcox, B. P., Rawls, W. J., Brakensiek, D. L., and Wight, J. R., 1990, Predicting runoff from rangeland catchments: A comparison of two models: Water Resour. Res., 26, 2401–2410. Willmott, C. J., 1981, On the validation of models: Phys. Geogr., 2, 184–194. Zhu, X., Zhang, M., Wang, S., Qiang, F., Zeng, T., Ren, Z., and Dong, L., 2015, Comparison of monthly precipitation derived from high-resolution gridded datasets in arid Xinjiang, central Asia: Quaternary International, 358, 160–170.